Screwdriver to remove the chair seat (Phillips or flat-head, depending on the type of screws used to hold the chair seat onto the chair). Scissors or utility knife to cut the old fabric off the chair. Needle-nose pliers to remove old staples holding the stained fabric down. High quality upholstery fabric. For six dining room chairs, I required 2 1/2 yards of 54" width home decorating fabric. The fabric must be purchased in whole yards, so I purchased three yards of fabric. Reupholstering dining room chairs is a very easy home improvement project to undertake, and the results give any room an instant face-lift. 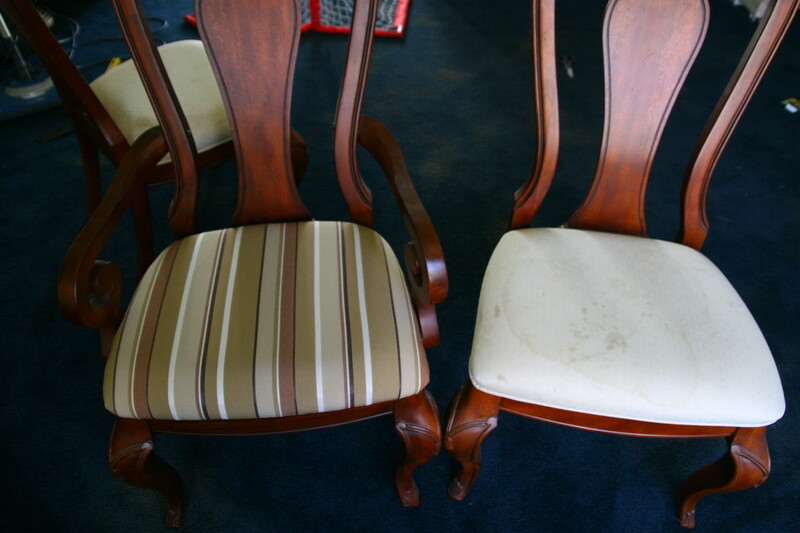 We had six heavily stained dining room chairs in desperate need of a makeover. The cost of professionally reupholstering the chairs was prohibitive, so I took the plunge and bought upholstery fabric from a local craft and hobby shop. 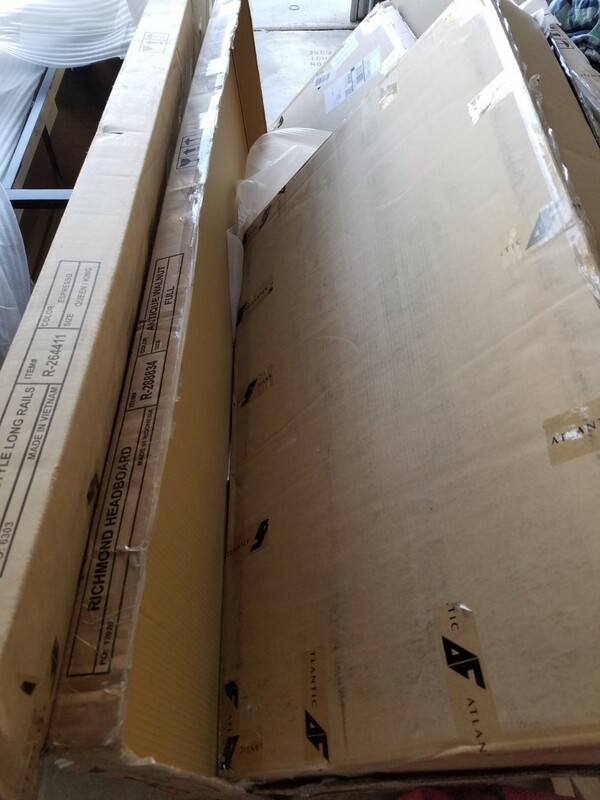 The total cost of reupholstering our six dining room chairs was $65, which included the shipping cost for the special-order fabric. This home improvement project requires no special skills: there is no need to sew, use heavy machinery, or make difficult mathematical calculations. I am not a "crafty" person and have no ability to sew, but I was able to recover all of our dining room chairs with little difficulty. The most difficult part of the process was actually removing the old fabric, which was held down with approximately ten million staples! The only tools required for this project are scissors, a screwdriver, needle-nose pliers, and a staple gun. The white, stained fabric on our dining room chairs was not washable. 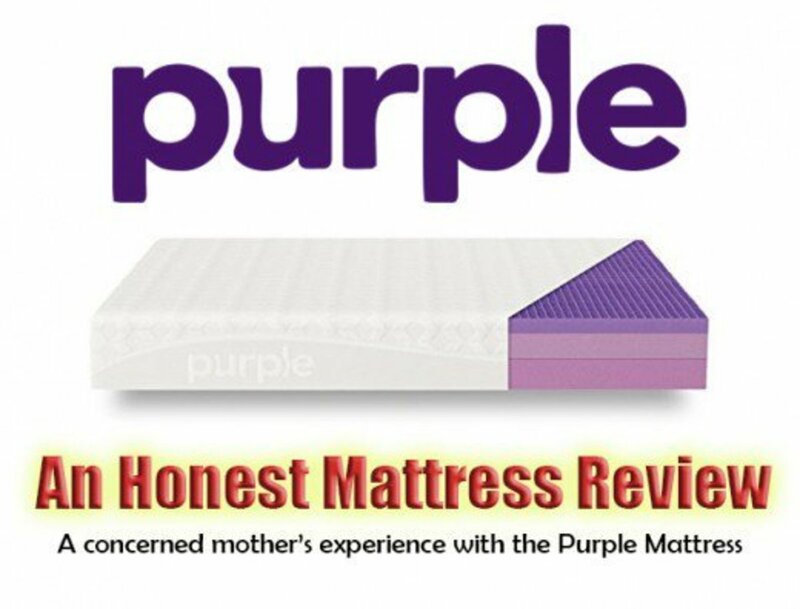 For our family, finding a cleanable, patterned fabric was a priority. 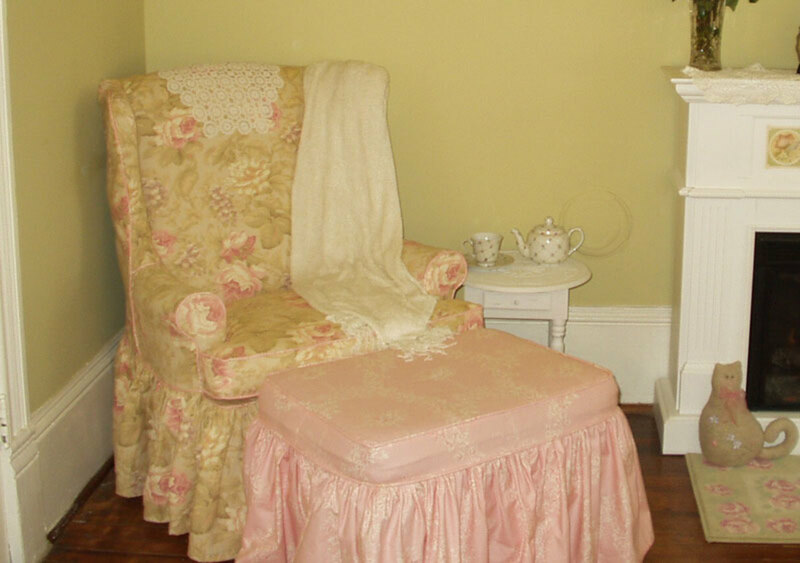 Upholstery fabric should not stretch easily, or the fabric will warp and become loose on the seat over time. Choose a tight weave in a non-stretchy fabric. The pattern on the upholstery fabric matters: solids and random patterns are easier to line up with a chair seat than stripes. 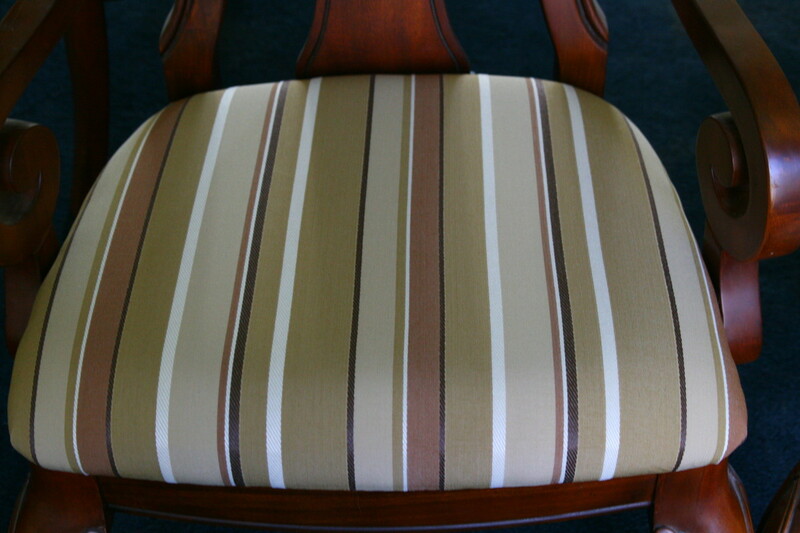 Despite the difficulty with aligning striped material, the upholstery fabric I fell in love with had a striped pattern: I simply lined up the fabric carefully with the chair seat and made sure the stripes did not get off-kilter during the process of stapling on the new fabric. 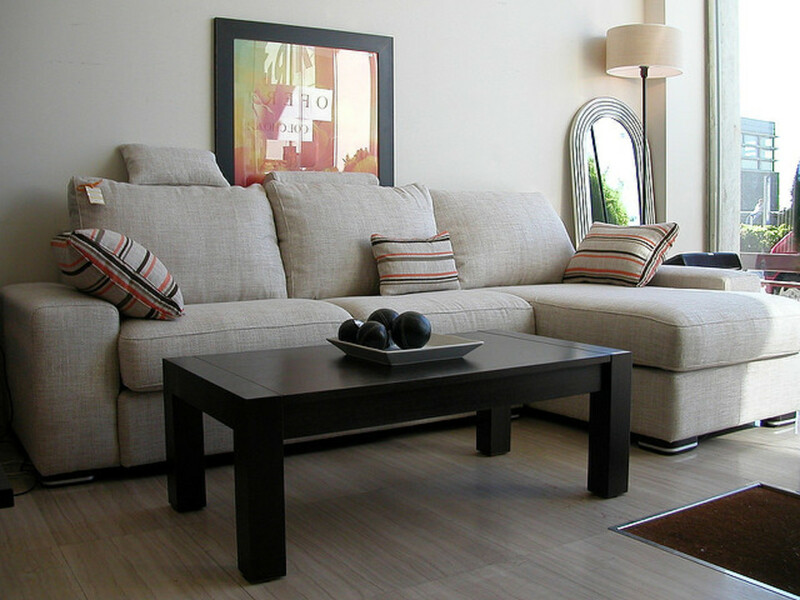 Upholstery material is usually a heavy fabric, and may be made from cotton, polyester, vinyl, or other materials. The "cleanability" of the fabrics will depend on the material: wool will have to be professionally cleaned, for example, while vinyl will be easy to wipe clean with a cloth. I chose a cotton/poly blend that was cleanable with solvents or water based cleaners. The label on the cloth will state how the material should be cleaned: check this label prior to purchasing your cloth. W: Clean with a water based cleaner. S: Clean with a solvent based cleaner (do not use any water or products containing water). S-W: Clean with water-based or solvent cleaners. X: Do not clean with water-based or solvent cleaners. Professional cleaning recommended. 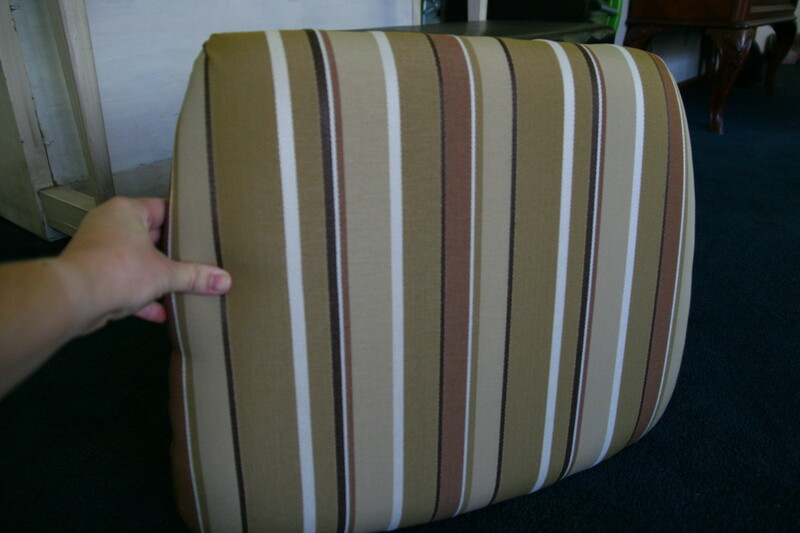 Upholstery fabric is sold in rolls, usually with a specified width. The fabric I purchased for my chairs, for example, had a 54" width. This was wide enough to accommodate two chairs. I purchased 3 yards of the 54" fabric to cover six chairs. To determine how much fabric you will need, simply measure the bottom of each seat and add approximately 6" to the outside edge. This will give you enough material to wrap around the seat and staple it to the bottom of the chair. Unscrew the seat of the chair. Remove the screws and set them aside in a safe place. Use scissors or a utility knife to cut away the old fabric. Use a flat-head screwdriver to pry up the old staples if necessary, and needle-nose pliers to pull the old staples out of the wooden seat base. If the foam of the seat is in poor condition, replace it with new high-density foam. Simply glue to new foam to the wooden seat base. I did not need to do this with our dining room chairs. Cut out a square of upholstery fabric to fit the seat. 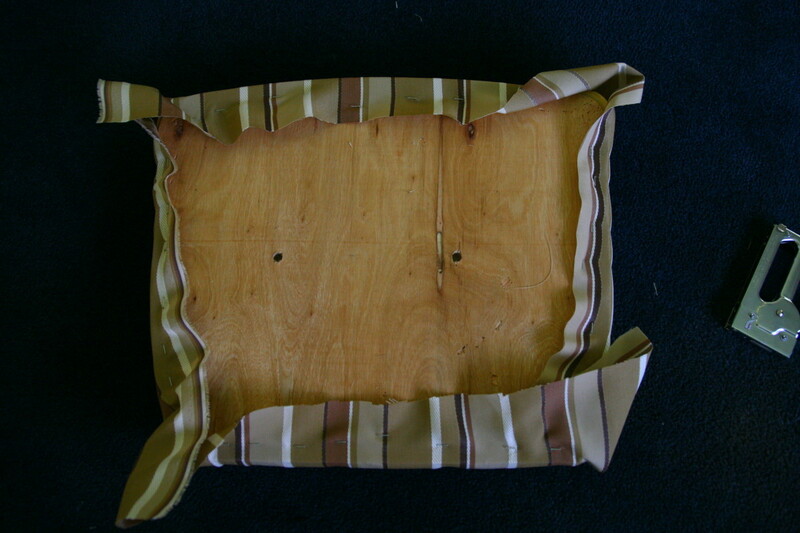 I cut a square about 4-6" larger than the seat of the chair, to have enough fabric to wrap and staple under the seat. 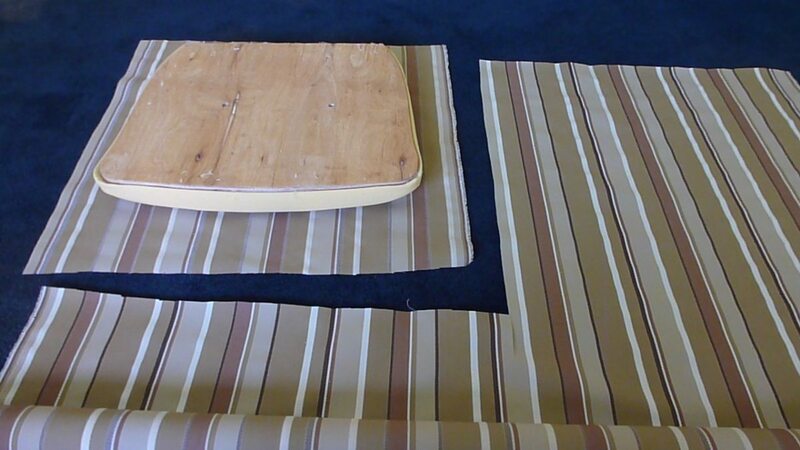 Place the seat cushion and wood base on the fabric, making sure the "right side" of the fabric is facing out. 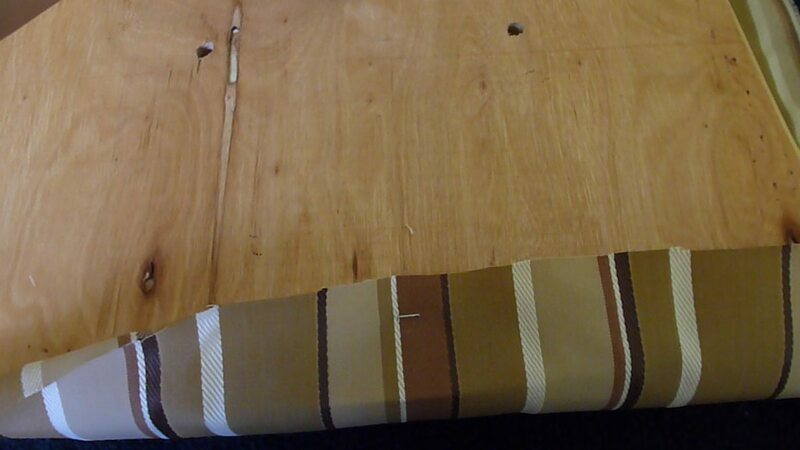 Grab a section of fabric and pull it very tightly: staple one side of the fabric to the wood base. Continue to pull the fabric until it is very taught and staple the fabric once on each side of the chair base to tack the fabric to the seat. Staple the fabric around the edges of the seat, pulling the fabric so that it remains taught. Pull the corners of the fabric in last, trying to create a smooth corner. You may need to cut some of the fabric away to get the best effect. Hold the bunched fabric very tightly and staple it down. Repeat with each corner. Place the reupholstered seat onto the chair and screw it back into place. 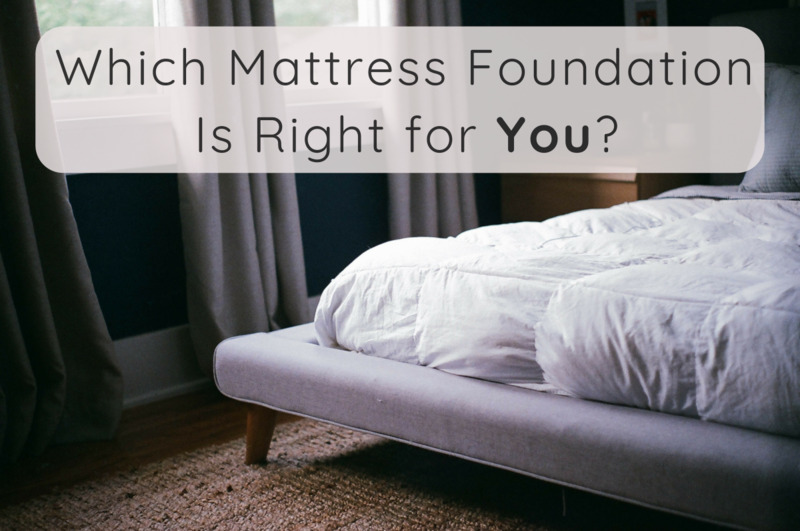 Why do you need to reupholster your furniture? My furniture is heavily stained and is not washable. I bought a great flea-market find, but the fabric needs to be replaced. My furniture is out-of-date and needs a more modern look. I changed the color scheme of the room and want the furniture to match the new look. Is it easier to use an electric stapler to reupholster a dining room chair? An electric stapler would likely make this job easier. It is possible to use a manual stapler (heavy-duty), but an electric stapler would make adhering fabric to the chair board very fast and effortless. The current fabric on my kitchen chairs is glued to the wood underneath the seats. I have reupholstered chairs before with staples. The gluing technique looks more difficult to do. What do you recommend? I far prefer using staples as they are easier to apply (with a staple gun) and remove if you need to adjust the tautness of the fabric. Glue also works, but has the negatives of 1) drying time, 2) difficulty in readjusting the fabric once dry, and 3) may make removing the fabric more difficult when you wish to reupholster again. Do you wash your fabric before upholstering your chairs? I did not wash the fabric I used for our chairs before upholstering. I chose a very sturdy upholstery fabric for the chairs, and it has held up very well, though I need to re-upholster since they have become stained again! It is a fun project to do, isn't it, moonlake? Now that I've done this once, I want to try it on some other furniture! Great hub. We do this all the time and it is so easy. Hyphenbird, it is really easy to do! I had never tried reupholstering before this project, and doing the dining room chairs was really easy. Take care if you have antiques, though - I would consult a professional if your chairs are valuable antiques. 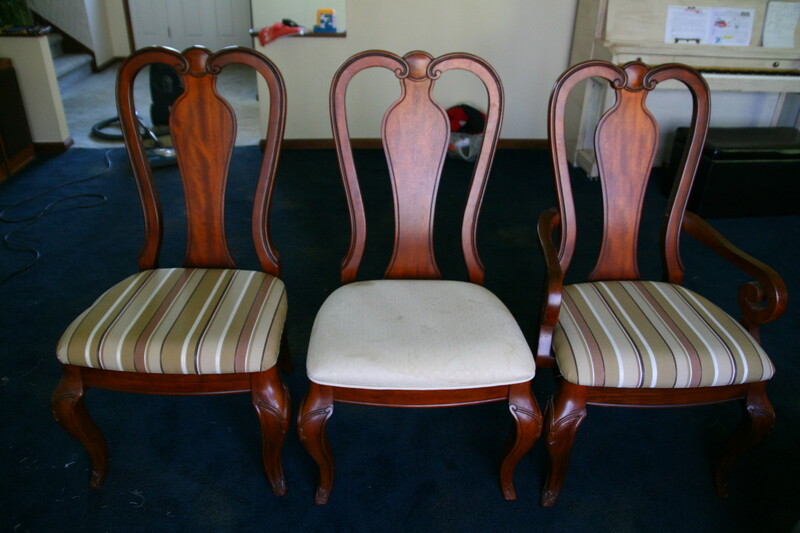 I want to get a couple of club-style chairs for our living room, and I'm looking at thrift shops now that I know reupholstering chairs is so easy! You got me inspired to cover my nasty chair seats. These are beautiful chairs and were given to me. Unfortunately, they had sat uncovered in a warehouse for years so the seats are dirty. I will attempt this and thank you for the video. It is great. I am so pleased with how our chairs turned out, randomcreative! The kids can sit on the chairs and spill without ruining the furniture. Huge relief to this mama! Great tutorial! Thanks for the detailed video and instructions. Nan, it is really easy to do. I am not "crafty" by any means (the last time I tried to sew anything, I gave myself a blood blister). If I can do it, anyone can! I marked you up on this one. You made it seem so easy to do, that I am going to do (6) chairs this spring. Thank for all of your tips. I'm glad it answered your question well, Victoria! 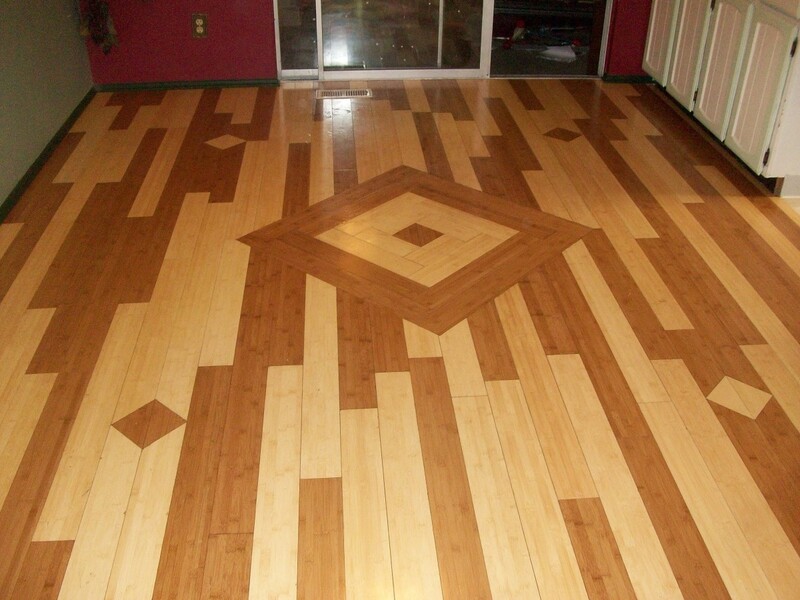 I love home improvement projects - small touches can make such a big improvement to any house! Awesome. You answered my question perfectly! 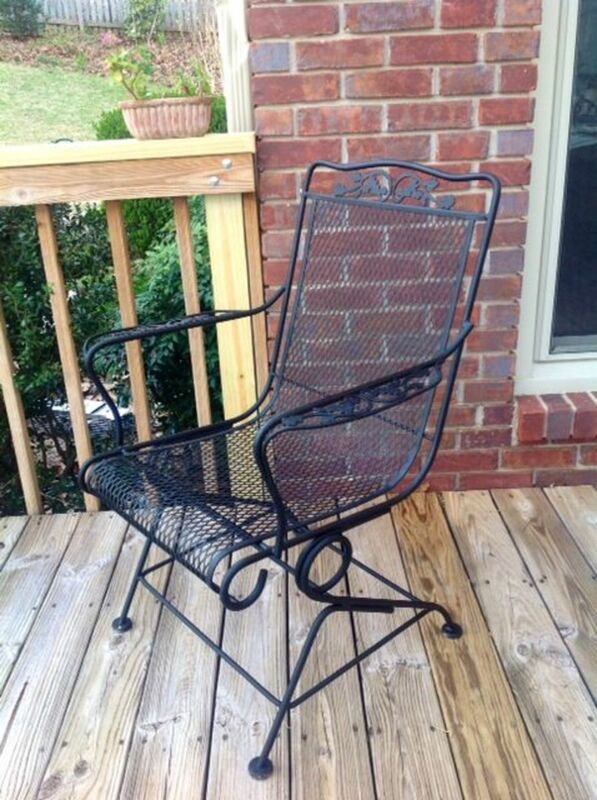 I have actually recovered some chairs similar to this before. They also had a light fabric. I didn't use high quality material though, so I'm going to have to redo them at some point. Your chairs look great. The video is a nice touch, too! Thanks for answering this question. Maybe we'll win something! Great job!